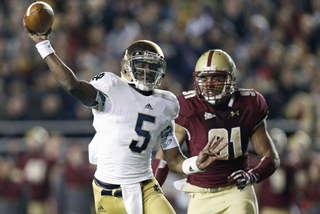 Notre Dame coach Brian Kelly believes Everett Golson is ready for what awaits him at Southern California. He believes the 6-0, 185-pound sophomore quarterback who did not play as a freshman is ready. Ready for the pressure of leading the Fighting Irish (11-0) on the field ranked No. 1 for the first time in 19 years. Ready for a rivalry game that has been dominated over the past decade by USC (7-4). Ready to help Notre Dame advance to the BCS title game with a win. Kelly said he bases that opinion by the maturity Golson has shown as he’s improved throughout the season, playing in tough venues such as Michigan State and Oklahoma and rallying the Irish from a two-touchdown deficit in the fourth quarter against Pittsburgh to a triple-overtime victory. “All of those things go into Saturday and all of those will be positives for him going into the USC game,” Kelly said. Golson said he is feeling more comfortable because of all he’s learned and he has learned to manage the clock better so he doesn’t have to rush each play. “I think I’ve progressed a lot,” he said. Golson keeps doing a lot more of the little things right and it's leading to more big plays for the Irish. He waited until the last second to pitch the ball to set up Cierre Wood’s 68-yard touchdown run on the fourth play against Wake Forest. He had TD passes of 50 and 34 yards against Wake Forest, and the second came after a nice pump fake. Slowly, Golson has turned what had been an at-best average offense into one that opponents are increasingly having trouble slowing down. Through Notre Dame’s first five games, Golson was 67-of-111 passing for 827 yards with three touchdown passes and three interceptions, with a pass efficiency rating of 126.46. He also had run for 40 yards on 27 carries. In the last five games, after sitting out against BYU with a concussion, Golson is 84-of-145 passing for 1,091 yards with eight touchdowns and two interceptions, a pass efficiency rating completion rate of 136.58. He’s also run for 202 yards on 53 carries — and that includes just one carry in the win over Wake Forest. The Irish have improved during that span from 71st in the nation in total offense, averaging 398.4 yards a game, to 50th, averaging 419.7. “He’s definitely on the right path to providing us the offense that we need,” Kelly said. The coach admitted he hasn’t run Golson as much as he'd like because he still needs to get stronger. Golson is the fourth quarterback in Notre Dame history to start his career with nine straight victories. He would have 10 straight if he hadn't been benched the first three plays against Miami. The school record is 11 wins by Bob Williams during the national championship season of 1949. Last week, the focus was working on footwork and communicating with teammates, calling plays and then checking into different plays. Kelly had Golson watching film of Peyton Manning and other quarterbacks. As for the pressure of playing at USC with Notre Dame eager to win its first national championship since 1988, Golson said he’s taking the same attitude he’s taken all year of focusing on the opponent and not worrying about the big picture.